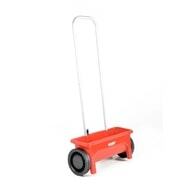 Manual spreader with tank volume of 12 litres. Designed for distribution of fertilizers and seeds, in winter even salt. 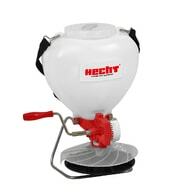 Manual spreader with tank volume of 20 litres. Designed for distribution of fertilizers and seeds, in winter even salt. Manual spreader with tank volume of 27 litres. Designed for distribution of fertilizers and seeds, in winter even salt. Adjustment of distribution volume at grip. 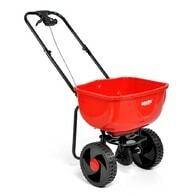 Manual spreader with tank volume of 29 litres. Designed for distribution of tertilizers and seeds, in winter even salt. Adjustment of distribution volume at grip. 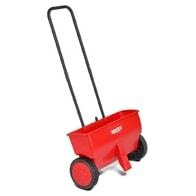 Manual spreader with tank volume of 60 litres. Designed for distribution of tertilizers and seeds, in winter even salt. Adjustment of distribution volume at grip. 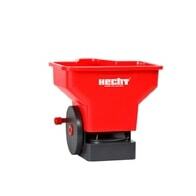 Manual spreader with tank volume of 60 litres. Designed for distribution of tertilizers and seeds, in winter even salt. Adjustment of distribution volume at grip. Tow-behind spreader for large areas of ground.